Automation itself is defined by Dictionary.com as, “the technique, method, or system of operating or controlling a process by highly automatic means, as by electronic devices, reducing human intervention to a minimum.” Recruiting automation is essentially the automatization of the recruiting process, so that certain tasks are done by a software or tool in a faster and simpler manner. First off, the amount of information that needs to be processed continues to increase for many companies. The more open jobs, the more information that needs to be handled. Automation makes dealing with large amounts of data more simplified. Technology as continues to evolve and change, becoming more and more intelligent. Utilizing this technology is vital for staying ahead of the game and will ensure that your recruiting process doesn’t fall behind the times. As the unemployment rate continues to decline, the war for talent becomes an even harder battle. With so many passive candidates, it seems difficult to find ways to recruit qualified individuals. But recruiting automation can help to improve the hiring process and make it simpler for everyone. One of the major benefits of recruiting automation is increased productivity. By automating tasks, you will have more time to dedicate to other tasks that may have been neglected or rushed in the past. The truth is, no one really wants to do those redundant tasks like data entry or sending out 100 individual emails to different candidates. So why not eliminate these types of task when it’s possible? Another benefit of recruiting automation is the ability to nurture candidates in an easier way. Through automated emails and newsletters, you can stay in touch with more potential candidates without having to create an individualized process for each one. 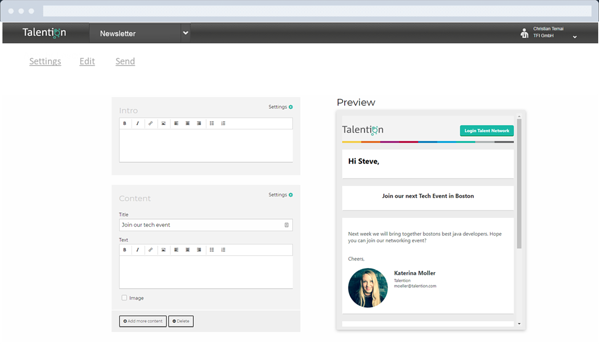 And through candidate nurturing, you can improve the overall candidate experience. Would you like to learn more about how you can implement recruiting automation into your recruiting process? We will gladly show you further best practice examples and concrete implementation in the Talention software. Request a demo here now.